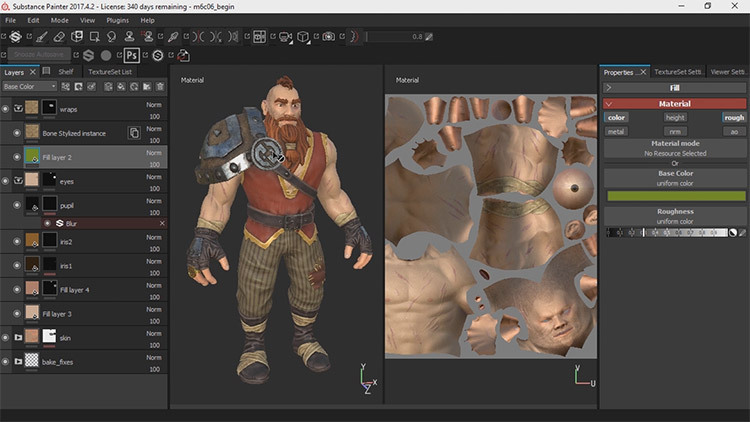 Substance Painter is recognized as the most innovative texture painting software on the market. 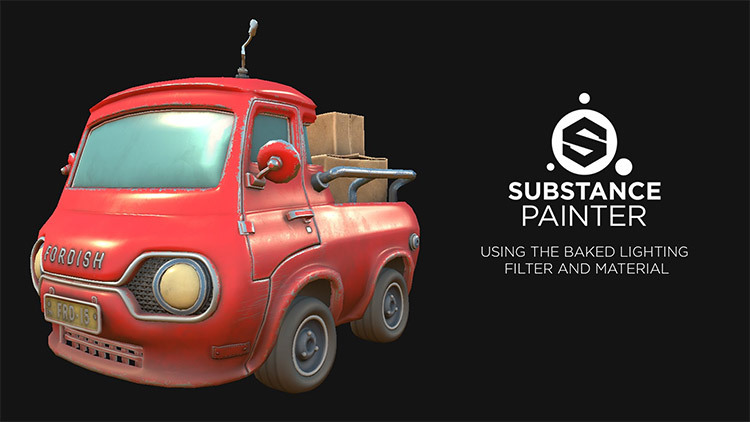 With Substance Painter it has never been easier to create gorgeous textures for your models with ease. 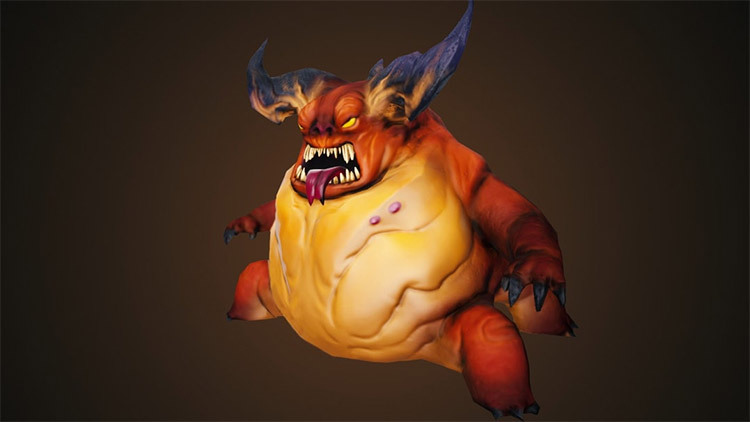 If you’re looking to make pro-quality 3D models for video games or animation projects then you’ll want to learn this program. To help you learn the ropes of the program we’ve compiled a list of the best tutorials for novices and intermediate users alike. With these high-quality instructional videos & courses you’ll be well on your way to mastering Substance Painter. This entry level tutorial is designed for complete beginners and those who have never used the software before. It covers the basics of navigating the program and provides some background as to what Allegorthmic’s Substance Painter is all about. You’ll learn about PBR shaders(physical-based rendering) and how they fit into the game-asset pipeline. The instructor gives an overview of how to import and a texture a model from scratch. He includes a detailed explanation of the various settings available for creating your assets too. Substance Painter’s non-destructive workflow means that you can change settings and texture sizes at any point. This is great for experimenting with different texture maps without having the restraints of a strict workflow. Part of this tutorial is devoted to explaining some of the most common tools available for painting your textures. Lastly this tutorial shares a few shortcuts and commands that you should memorize to develop a pro workflow. This detailed, hour-long instructional video is a great place to start learning Substance Painter. If you’re a student or teacher you can get a one-year license of the program for free. All you’ll need is a copy of your student ID. This tutorial covers the basics of the program including how to import and export models and configure settings for the Unity and Unreal game engines. After some quick instructions on how to set up your drawing tablet you’ll learn how to combine textures and paint them. Using Substance Painter it’s easy to create heightmaps and bump maps to give your models extra details. This crash course by Dylan Mellott covers all the essentials necessary for getting started with Substance Painter. He explains the user interface, using materials, the layer structure, and particle systems. Towards the end of the video Dylan provides some general tips and tricks that are useful to know regardless of skill level. 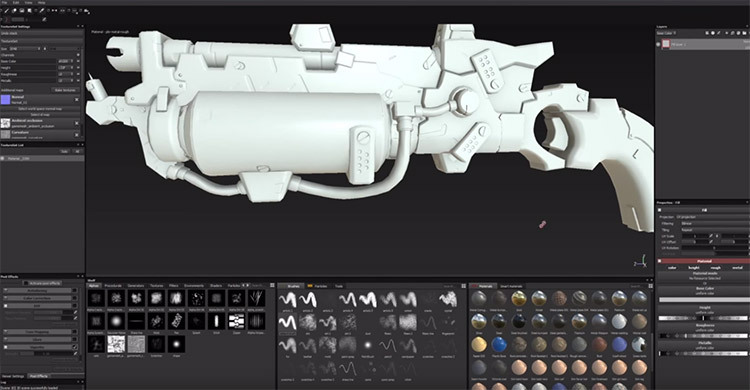 Dylan explains the workflow of Substance Painter by walking you the process of texturing a cool sci-fi gun. There’s a ton of useful information in this tutorial on how to really tap into the true power of Substance Painter by taking advantage of the non-destructive workflow. After setting up the basic structure of your texture it’s easy to adjust settings and get a wide variety of effects. This way of working is great for exploring a variety of options and bringing out your creative potential. Here’s a nice tutorial designed to quickly guide new users into the workflow of creating textures with Substance Painter. 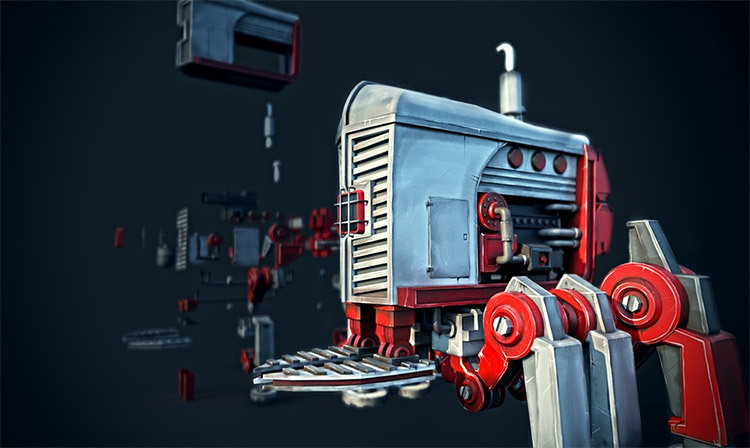 It offers a set-by-step approach to asset creation and covers such features as starting a new project, creating a basic texture, and exporting texture maps. By the end of this video you should have a solid grasp of the core features of Substance Painter and how to texture your own 3D models. With clear instructions and a slow pace, this video is an excellent guide to creating simple yet very powerful texture assets. 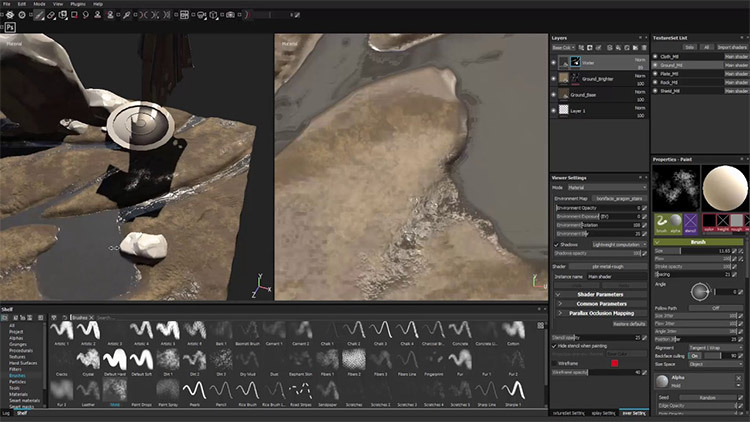 Provided by Allegorithmic, this video offers very detailed descriptions of the essential workflow and key features available within their software. 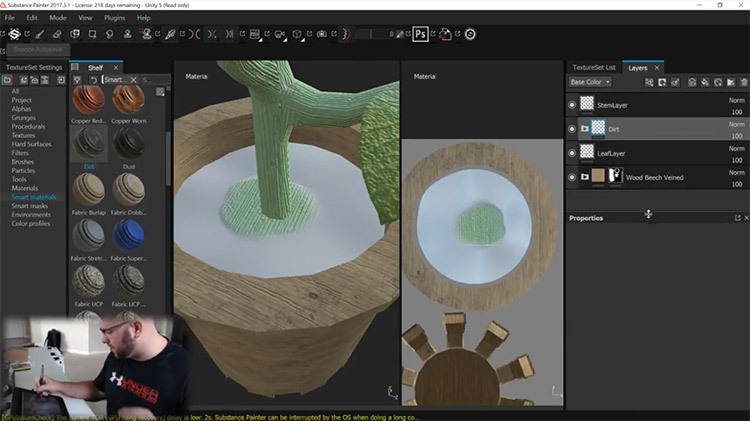 The source files are provided in the video’s description so you can follow along with the instructor as they guide you through the entire process of texturing a simple model. Steve White from pixelfondue provides a detailed look at using Layers and Masking in Substance Painter. This a powerful set of features that allow you to combine and blend various texture layers to quickly create complex surface materials. The appeal of PBR shaders is the elaborate realism and dynamic lightning effects that can be obtained with little effort on the part of the artist. With one stroke of the brush Substance Painter can simultaneously create height information, smoothness, color, reflections, and much more. This tutorial walks you through creating a variety of textures and substances so that you have a strong grasp of what Substance Painter can do for your project. Once you master the basics of using this software it’s possible to create just about any real-world material you could imagine. Michael Pavlovich from CG Master Academy offers an in-depth look at the textures and materials available within Substance Painter. In this hour-long video Michael shows how to start with a basic material and work towards a more refined, specialized texture for use in games and animations. 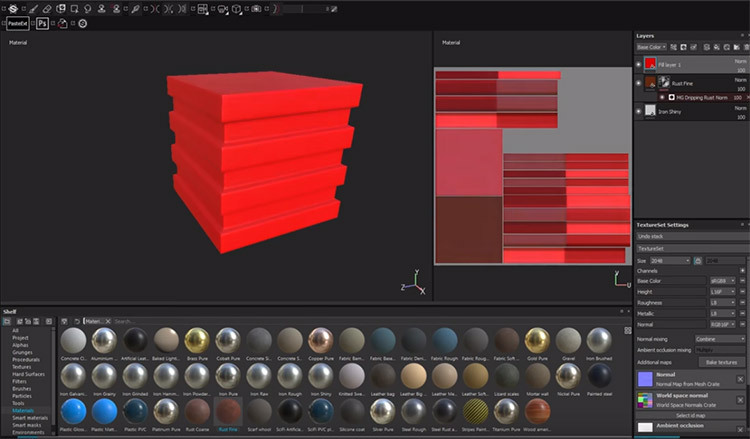 Substance Painter has an elaborate system of customizable properties and stackable layers that lets you create an almost infinite variety of materials. Using a simple robot model, Michael guides you through the process of creating a highly-detailed material that approximates rusty metal complete with dings, rust spots, and surface texture. Painting skin can be a challenge. Especially when it comes to 3D models. Lucky for you Substance Painter makes it easy to get seamless UV textures that look and feel natural so that you can concentrate on getting a beautiful paint job. When it comes to painting skin, subtly is the name of the game. By combining layers and building up subtle variations in tone and color it’s possible to get gorgeous skin tones in Substance Painter. This video takes the task one step further and shows you how to add freckles to your models which go a long way in adding realism. Lastly you’ll learn how to manipulate the lighting settings available in Substance Painter to achieve just the right amount of gloss and reflection. Most of the tutorials for Substance Painter focus on weapons and props, but this awesome video from UIW 3D Animation and Game Design shows techniques for painting organic objects. Follow along as this video paints a piece of terrain in real time. You’ll learn techniques for painting grass and rocks using a variety of brushes. The best part about this video is that its takes you through the full process of painting and loading your assets into your game engine of choice. 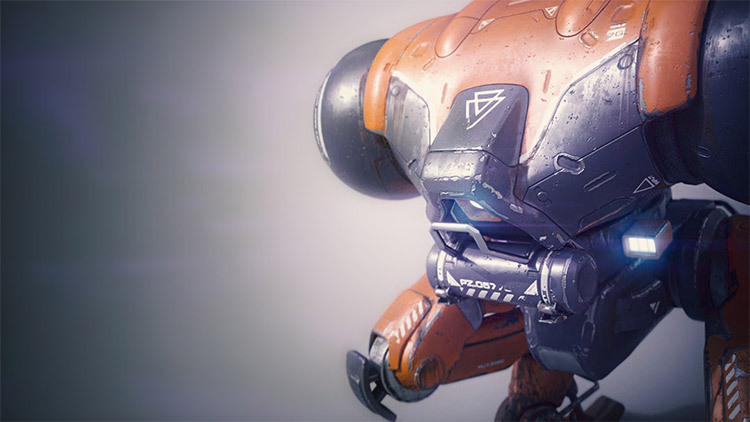 Whether you use Unity or Unreal, you’ll learn how to adjust your settings to ensure that your exported textures maintain all the detail and vibrancy of Substance Painter. Baked Lighting is a powerful tool that allows artists to capture complex lightning and materials for use in games. With Baked Lighting you can ‘bake’ the lightning and materials of a scene directly into the texture. This process allows you to get beautiful lighting without losing performance. As such it’s a great tool for mobile developers working with limited hardware. In this video you’ll learn how to take advantage of the Baked Lightning filter available in Substance Painter 2+ and create your textures for use in game development. 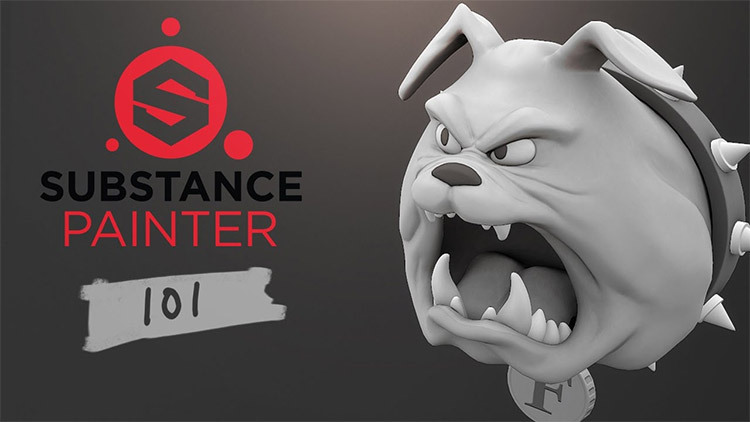 Professional character artist and instructor Andrew Smith created this tutorial for intermediate game artists looking to improve their skills in Substance Painter. He’ll show you how to prepare your model in ZBrush and export it using 3ds Max before texturing it in Substance Painter. Andrew is an excellent artist with a plethora of a great tips and tricks to improve your skills. 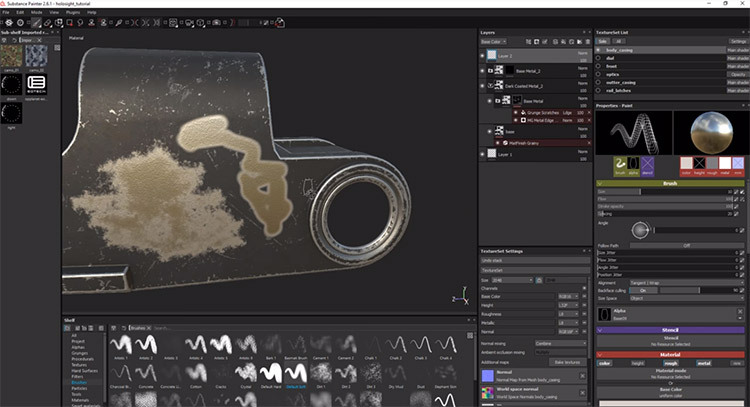 Not only will you get to see the workflow of a professional but you’ll learn how to bake textures so that you can transfer all the rich features and dynamic lightning effects available in Substance Painter onto a simple texture for use in your games. While this course does cover the basics of Substance Painter it assumes some knowledge of 3D modeling and game asset creation. So this is not a great starting point for absolute newbies but definitely a nice resource for anyone beyond that stage. 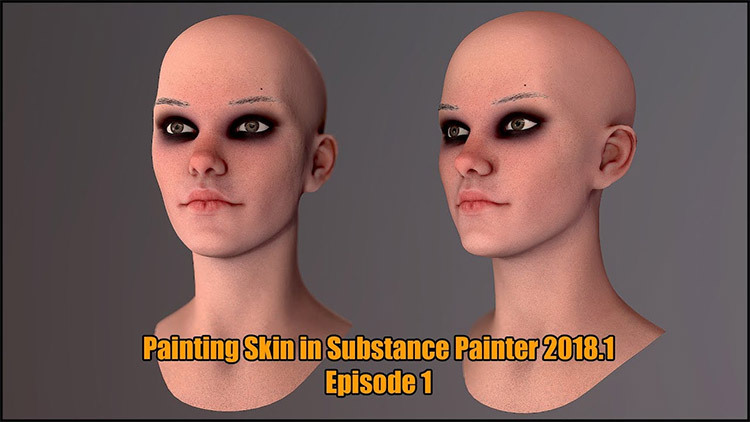 In this highly rated course by artists Victor Kam you’ll learn the fundamentals of Substance Painter and how to use this software to create professional textures for your 3D models. Victor first introduces the software and shows how mesh data can be used to texture a mesh procedurally. After that you’ll walk through the process of setting up a project in Substance Painter(easy stuff). Lastly he’ll cover baking texture maps for use in games. By the end of the course you’ll have a strong understanding of how to use Substance Painter in a real studio environment. 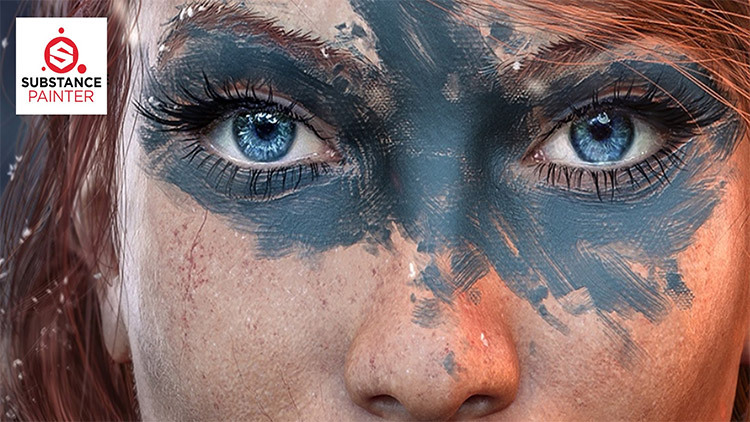 Hand-Painted textures have long been a staple of the video game artist’s toolbox. Not only can this technique overcome technical limitations but it can be used to create unique and original art styles. With this course you’ll learn how to create standard effects like metal and water without relying on dynamic lightning or reflections. Within this video series you’ll see how to create organic surfaces like wood grain, fruit, and weather effects. By the end you’ll understand how to build beautiful painterly textures that will stand out in any portfolio. Texturing is a necessary part of game asset creation. In this course you will learn the process of painting textures for game characters using the advanced features of Substance Painter. 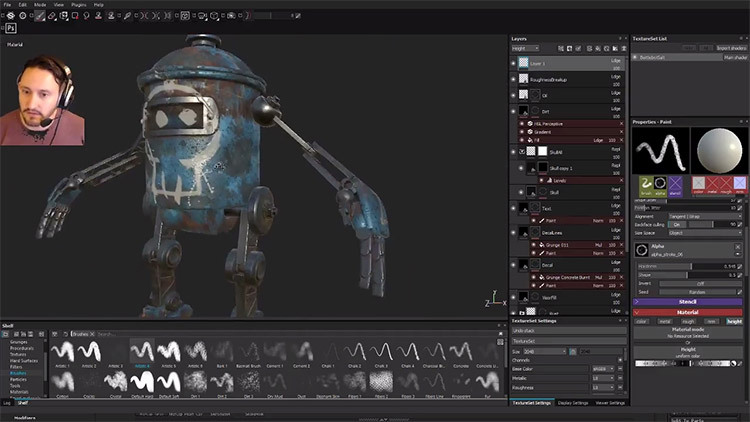 Walking through the step-by-step process of painting a texture you’ll learn about the powerful features of Substance Painter like Smart Materials and map baking. Incredibly valuable lessons for anyone serious about character design or 3D modeling. With this course you’ll learn everything you need to create high quality assets for the Unity game engine. This tutorial series focuses on creating realistic textures for your characters. You’ll see how to build natural skin tones by blending and mixing various paint layers together. You’ll also learn to utilize the non-destructive workflow of Substance Painter to create realistic cloth. Once the texturing is complete the instructor will walk you through the process of baking out your texture map. This is an excellent place to start for artists looking to create realistic characters that meet today’s high-quality standards. In this game design tutorial you’ll learn tips and tricks for creating believable animal characters. 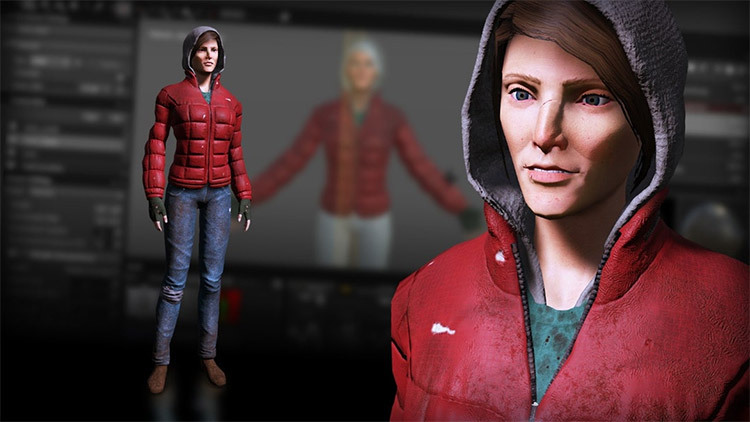 The first part discusses how to sculpt your 3D models so they can be properly animated. 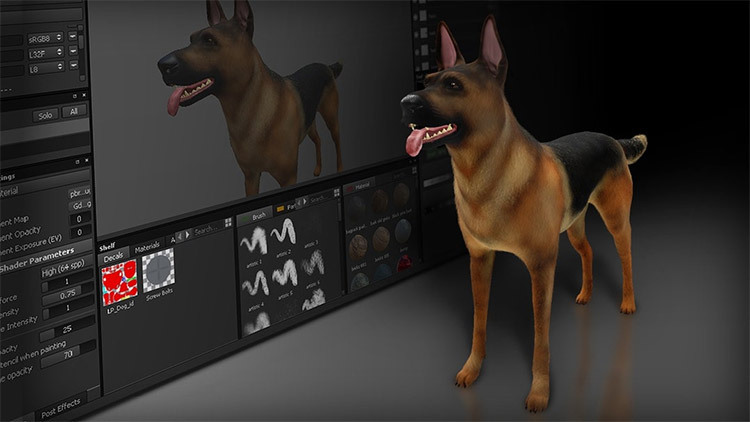 Next you’ll move into creating textures for a simple dog model using texture baking and ambient occlusion maps. As the series progresses you’ll learn how to create realistic fur using a variety of techniques in Substance Painter. By the end of the series you’ll gather enough knowledge to create a fur texture on your own with plenty of subtle details that’ll make your work pop off the screen. In this lengthy video series you’ll learn to quickly produce stylistic textures for your 3D models at rapid speeds. While more time consuming that procedurally generated materials, painting stylized creatures can yield exciting and original results. This course focuses on creating an efficient workflow so you can get better results faster using advanced techniques in Substance Painter. You’ll learn how to use the toolset to improve your painting skills and create amazing creatures for video games. 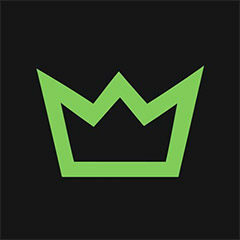 An absolute must-watch if you’re looking to get into the gaming industry.